We Back! And this episode is all about YOU, OUR LISTENERS! You’ve been writing and we’re delving into your letters plus what’s good (Crystal does TEDx and gets a jury duty notice, Thea starts a new book and NeKisha falls in love with LA) collection plate causes! 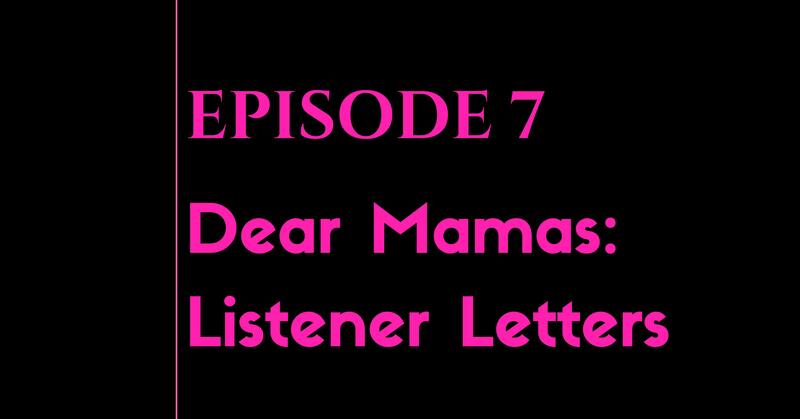 Listener Love – What the Mamas Mean to Me. Letter #1 – Does rooting your birth story in pain impact your mothering? Letter #2 – Get Money or Give Back? Letter #3 – Let’s Stay Together…Or Not: Should I Keep My Black Family Together? Polaris Project: Polaris is a leader in the global fight to eradicate modern slavery. Named after the North Star that guided slaves to freedom in the U.S. , Polaris systemically disrupts the human trafficking networks that rob human beings of their lives and their freedom. Our comprehensive model puts victims at the center of what we do – helping survivors restore their freedom, preventing more victims, and leveraging data and technology to pursue traffickers wherever they operate. Peace Over Violence: Peace Over Violence (formerly LACAAW), established in 1971 by pioneering feminist activists, is sexual and domestic violence, stalking, child abuse, and youth violence prevention centered headquartered in Los Angeles and dedicated to building healthy relationships, families, and communities free from sexual, domestic and interpersonal violence. Purpose Driven Passports: Purpose Driven Passports is a community of travelers dedicated to improving the lives of local citizens in the countries they visit. Each year we identify 3-5 projects to support, and collaborate to provide financial resources, supplies, and people needed on the ground to get the job done. We also create community service ideas that people can do on their own trips, and connect travelers with places they can make a big difference in only a few hours on vacation. Ultimately, our vision is a world where families are fed, babies are held, homes are built, kids are inspired, and people around the world are empowered and supported by those who vacation in their communities.